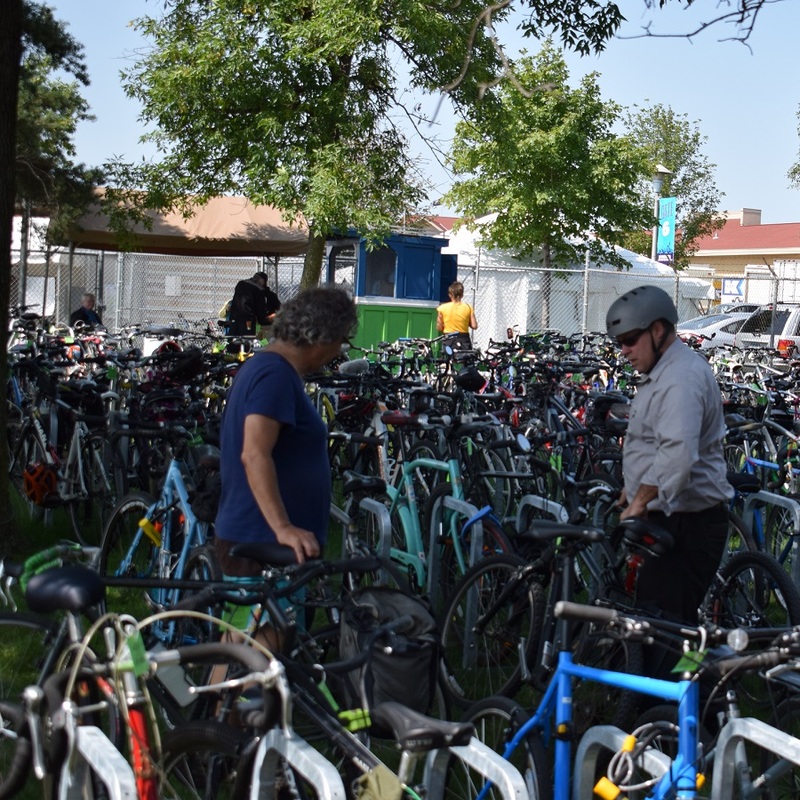 It’s that time of the year again and what better way to go to the “Great Minnesota Get Together” then by bike and parking in one ot the three, free bicycle corrals there. 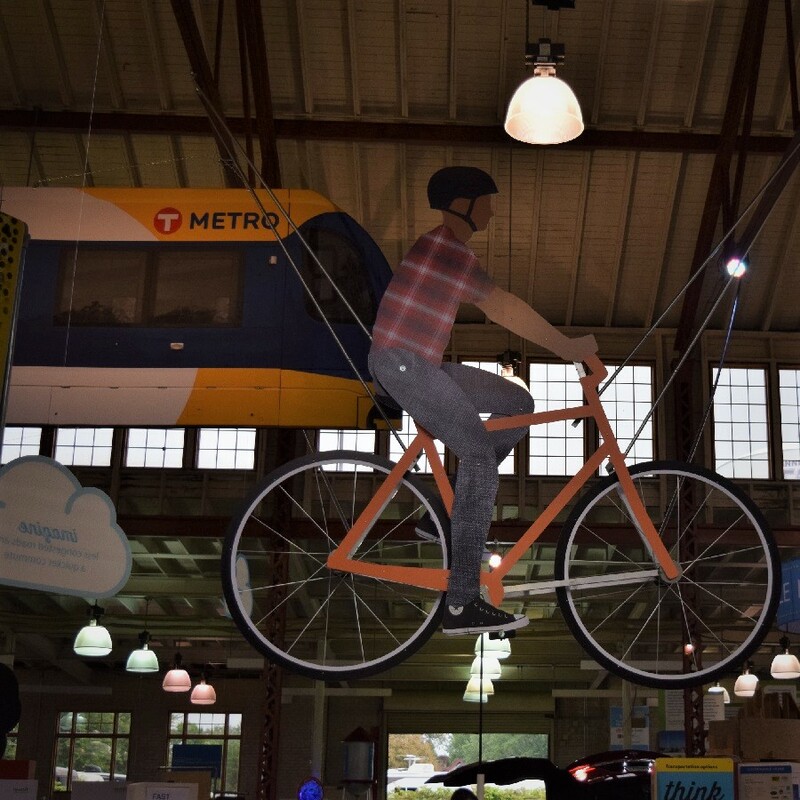 Riding from home or drive/park a few miles away and multi-modal commuting with your bike can take a lot of the hassle factor out of visiting the fair. It is also a great way to burn-off those extra calories from all of the fun things you may want to indulge in, on a stick. It is probably the fastest and most inexpensive way to get to the fair, riding your bike. If you don’t live near the fair, a multi modal commute is another fun option. Drive your car, with your bike(s) along and park it in one of the St Paul neighborhoods, close by. Then bike in on one of the city’s designated bike routes. Use this St Paul map along with Google Maps, to plan your route to get to the fair. Riding your bike is probably the fastest way to get to the fair. West Bike Lot: Randall Ave-Buford Gate (#16). For cyclist coming from Minneapolis and the western suburbs, this is a handy location and in the past has the most options for parking and convenience. North Bike Lot: Hoyt-Snelling Gate (#2) For cyclist coming from north Metro, this is a handy location and in the past has had more options for parking and convenience than the South Bike lot. South Bike Lot: Como-Snelling Gate (#6) the most popular location, this bike corral fille fast especially on weekends. Another option is to take one of the free shuttle buses from a satellite parking lot. Allow one to two hours each way for this option. 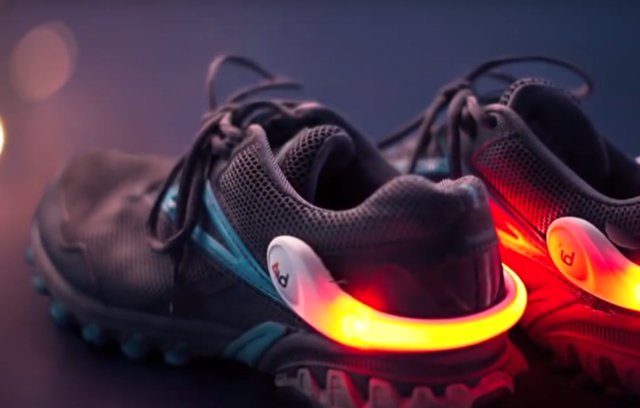 The lighted spurs clip to your shoes so you are more visible when riding your bike. Now that you are in the fair grounds and walking around here are some bike related ideas you might like to see. Need some lights to lite up your bike shoes for more visibility at night; Maybe a new Minnesota Bike Map from MnDOT; or the latest on e-Fat Bikes? It all at the Minnesota State Fair. 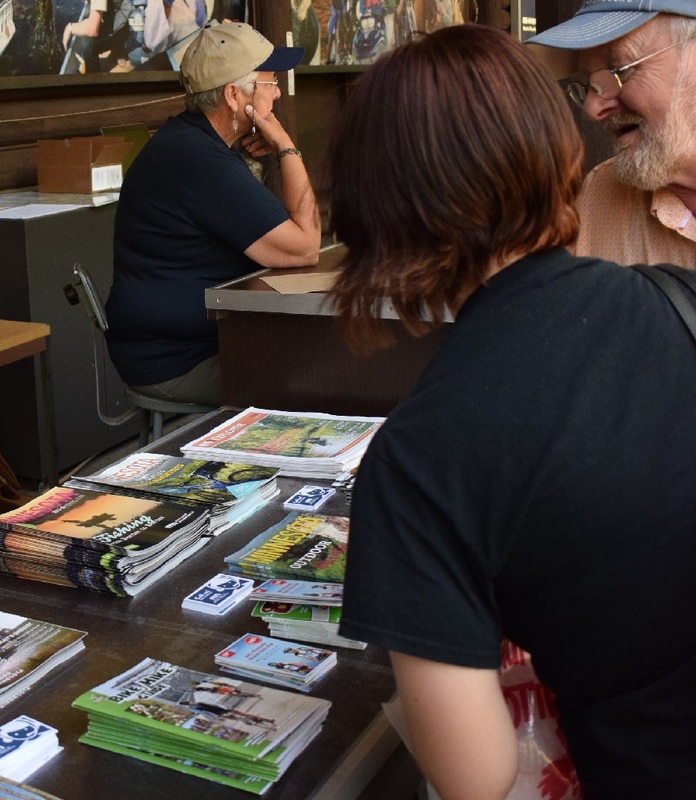 Pick up one of the last few remaining 2018 MN Bike/Hike Guides at the DNR Info Center. For the newest gizmo in bike safety and awareness, check out the clip on safety lights for your shoes while biking, See them in a booth under the Grand Stand. Need the newest Minnesota Bike/Hike Guide, in hard copy paper format? Head on over to the DNR Info Center. For the Minnesota Bike Map? You will find a paper copy, free of charge, right below the big bike hanging from the ceiling in the Eco Building. In the Creative Activities Building we found this clock. Congratulation Brad Kacter, from Shoreview, MN. 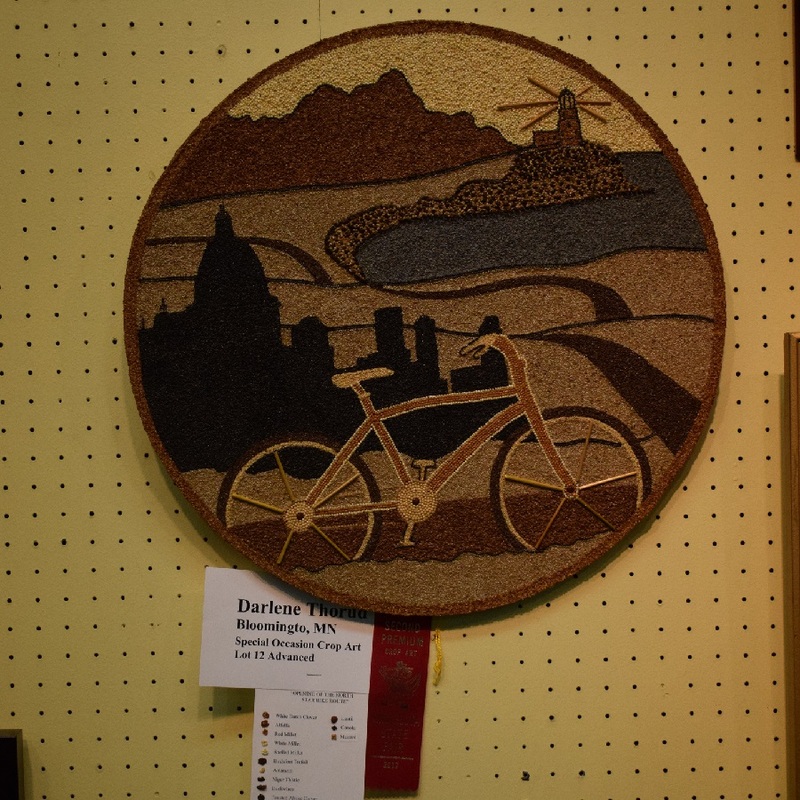 In the Ag-Horticulture Building last year we found this grain art piece. Congratulation Darlene Thorud, of Bloomington, MN. 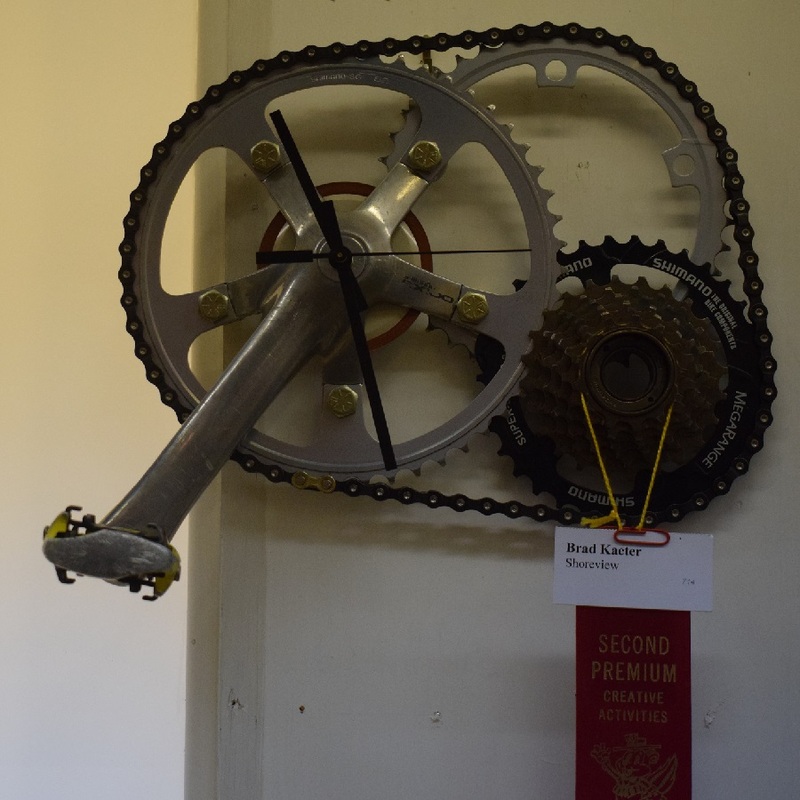 I wonder what bike art will be present this year? 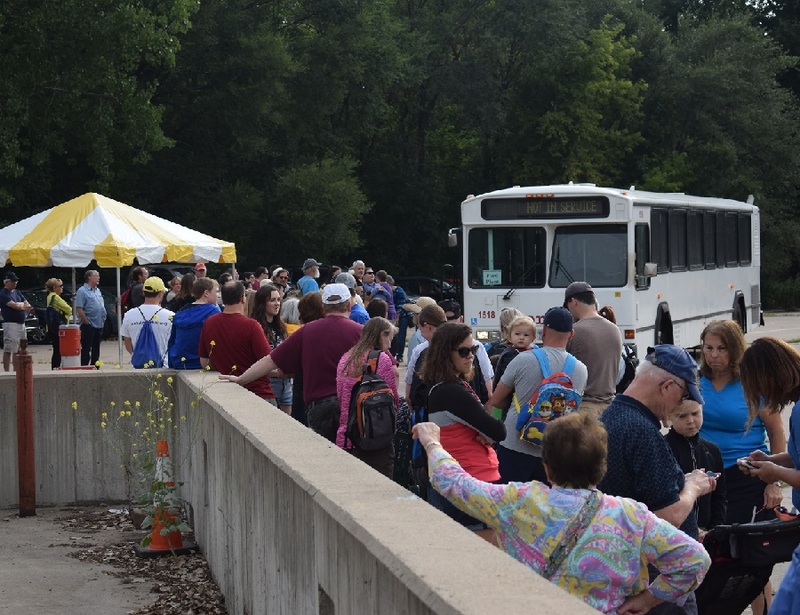 Each day at 2 p.m. on Cosgrove Street you can watch the Minnesota State Fair Parade. If you are lucky you might see the Twin Cities Unicyclists Club preforming. These single wheeled bicyclists always do some fun tricks as they pedal along the parade route. Besides the cyclists, you will see many different floats and marching bands. As the parade ends near the Eco Progress Center you can check out the “Life on a Bike Simulator” that’s right inside. CHECK THE LATEST IN ENVIRONMENTALLY FRIENDLY EXHIBITS IN THE ECO PROGRESS CENTER. Also, within the Eco Building check out the coalition of state agencies and private organizations whose goal is to get more people on bikes more often in Minnesota. Also check out the new Kick Gas exhibit with the “World’s Biggest Bike” hanging from the ceiling. You can hop onto a regular bike on the ground below, pedal and watch the gigantic 8-foot bike wheels turn above you. Also learn what you can do with all the extra t-shirts you have been accumulating and make grocery bags out of them. See more on the Eco buildings schedule and opportunities here. While there enjoy a sample of the latest coffee or tea at the Peace Coffee station. Like fun action biking stunts? Up in the X-Zone, on Machinery Hill in their new location (Murphy Ave and CosGrove St); watch some The Ride Factory preform some high-rising stunts, right in front of you, on the amazing exhibition course there. Watch the Ride Factory preform some high-rising stunts right in front of you. 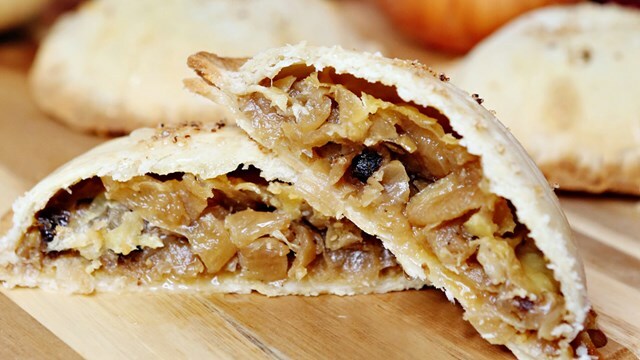 A favorite MN Fair food, the Tipsy Pie made with caramelized onions, gouda cheese and infused with brown ale was a hit last year. the Ahi Tuna Poke Bowl, Firecracker Shrimp Stuffed Avocado, Irish Tater Kegs just to name a few. Hope I can still get a cup of the maple cream nitro cold press coffee, leike last year? Download the Minnesota State Fair App. It’s absolutely free and features their famous Food Finder, Fun Finder and Merch Search tools to help you find your favorites at The Great Minnesota Get-Together. Available now absolutely free at the Apple App Store or Google Play store. Hope this helps you for your 2018 visit to the Minnesota State Fair. Please let us know, if we missed something you think we should add it to this preview article. Please leave a comment below. This entry was posted in News and tagged #nextbikeadverture, AAA Roadside Service, app, bike art, BMX Stunts, Eco Progress Center, Fat bikes, Free Bike Guide, free bike maps, fun foods, Great Minnesota Get Together, Minnesota Bike Guide, Minnesota Bike/Hike Guide, Multimodal transportation, parades on August 14, 2018 by Russ Lowthian. This bike pic, Wheelie Wednesday, we thought it would be fitting to show a picture of the BMX’rs from The Ride Factory. They performed some high-rising stunts right in front of an audience last year up at the X-Zone, up on Machinery Hill, at the Minnesota State Fair. We hope to see them back, will keep you posted. Remember, take a chance, if life were a mountain bike trail and a Bunny Hop or Wheelie Wednesday helped smooth out your day-to-day ride or aided you to drop into your sweet spot. Why not review the following tips to make your week an adrenaline high? 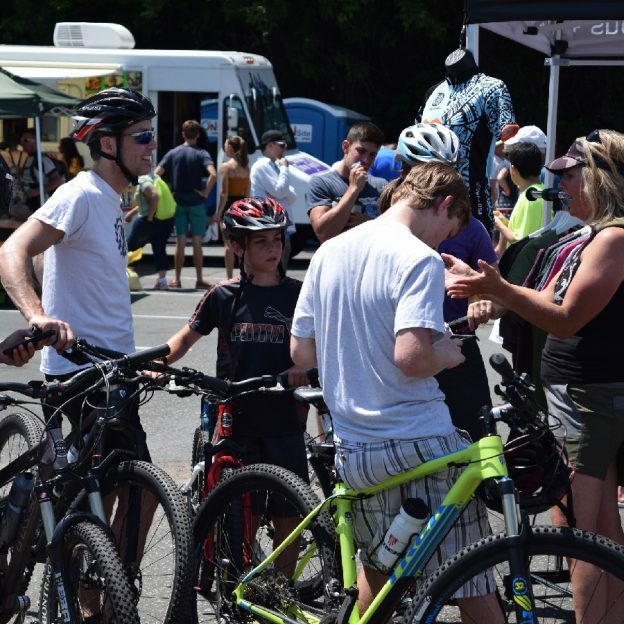 Get into the zone and plan your next bike outing with family and friends at one of HaveFunBiking Destinations. Thanks for viewing our ‘Wheelie Wednesday’ bike pic! 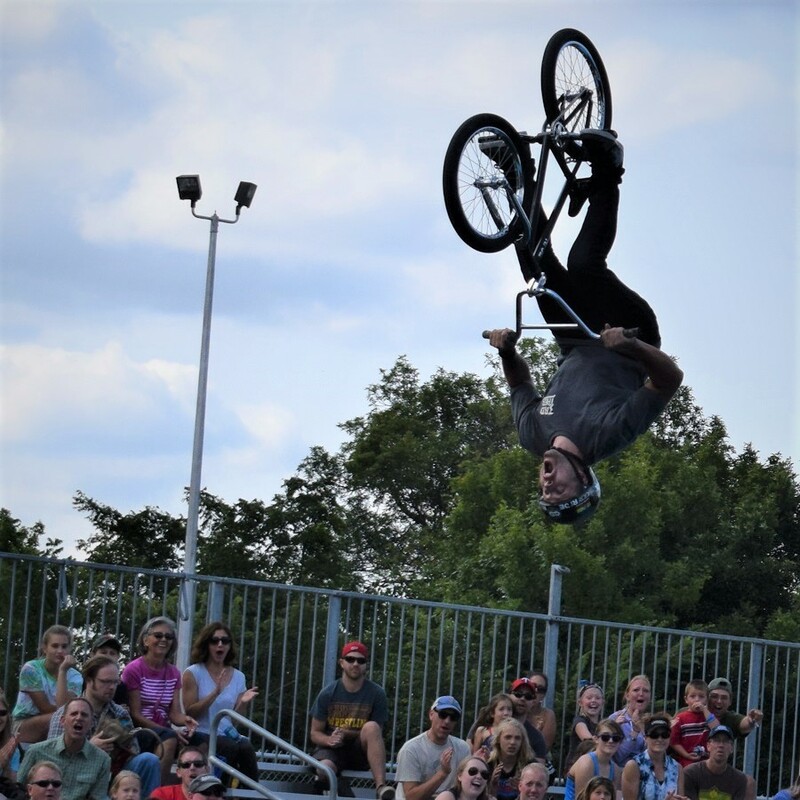 This entry was posted in Picture of the Day and tagged #nextbikeadverture, BMX Stunts, bunny hop, Free Bike Guide, free bike maps, fun foods, Great Minnesota Get Together, machinery hill, Minnesota Bike Guide, Minnesota State Fair, the Ride Factory, X-Zone on August 8, 2018 by Russ Lowthian. Now that it’s Friday, it’s time to ride off for a weekend of fun on that next bike adventure. If you are going to the Minnesota State Fair, check out our hassle-free get-to-the-fair-tips and while there take in the Ride the Factory stunt show. What better way to continue your summer fun and your #NextBikeAdventure. View all the fun ideas and bike destinations in the latest Minnesota Bike/Hike Guide. Then plan your next outing with family and friends in one of Minnesota’s HaveFunBiking Destinations. 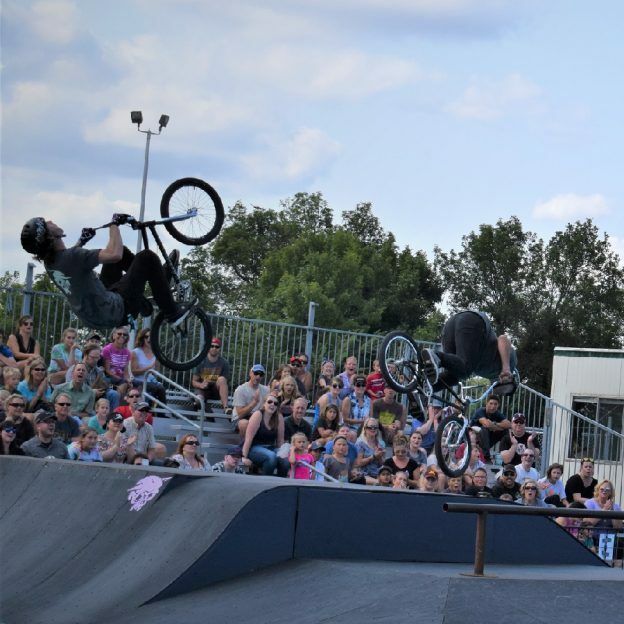 This entry was posted in News and tagged #nextbikeadventure, BMX Stunts, Friday, Great Minnesota Get Together, Minnesota State Fair, Ride the Factory, St Paul MN on August 25, 2017 by Russ Lowthian.